Wonderful We cannot say how much we enjoyed our stay.It it so quite and peaceful. The rooms where great. We would come back and stay again. Great place to stay!! What a great place to stay! Very clean, comfortable and relaxing. Great ocean views and we high recommend this vacation rental. VIEW WAS AMAZING My family really enjoyed the condo it was clean and had an amazing ocean front views. Our only problem was the hurricane that forced us to stay inside and only enjoy only one day of the outdoor activities. The management company continuously checked up on us making sure we were doing well and we knew what to do and brought us a flashlight and other supplies needed during the storm. Very relaxing. Beautiful condo and amazing view. We saw a lot of turtles. Great location. Very relaxing. Coming back again. Beautiful location and condo! 100 Hauoli St, Wailuku, HI, 96793, United States Date of Stay Sep 20, 2017 Helpful votes: 0/0 We truly enjoyed our stay in this condo. Right from the moment we walked in, the condo was clean and well appointed. They even placed tiny tropical orchids around the condo to give it a welcoming feel. The condo was stocked with everything we needed to feel at home. We especially loved the amazing ocean front view from the veranda and leaving the sliding doors open at night to hear the ocean waves. The master bedroom bed was very comfortable and the bathrooms were also updated nicely. We will be back! Thank you for helping to make our vacation memorable. Great location with amazing views The condo was clean, fully stocked kitchen, central location close to everything we wanted to do. Amazing views with the ocean right outside our back door! Another great Maui vacation! We thoroughly enjoyed our stay in this condo and would rent it again! There were 4 of us on this trip and plenty of room in the condo for all of us. The beds were fantastic, the kitchen well stocked, the lanai was very roomy so we could eat our meals out there, and the condo was very clean. The bathrooms came with soap and toilet paper which lasted us the week we were there. The kitchen came with dish soaps and paper towels which also lasted our stay. Plenty of towels in the bathrooms and the beach towels were terrific. The beach chairs, boogie boards, and umbrella were all in good shape as well and handy to have. The kids loved the condo swimming pool. 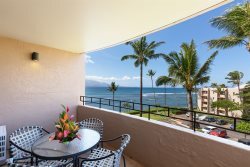 We stayed in this condo complex before and chose it again because it's centrally located in Maui. We also love that it's on a quiet dead end street. Plus the view of the bay from the lanai is such a treat! The rental company was very communicative and easy to work with. We had no issues but I think they would have taken care of it promptly if we had needed anything. We would definitely rent from them again! Glorious! We arrived on April 10, short drive from the airport easy directions. When we arrived the cleaning staff were just finishing up a little before 3:00. Pm. I asked we could drop our bags off and we would be out of their hair, they were just finishing up. Left our. AHS and went down to harbor. We had lunch and a cool drink. Weather change of 46 degrees was welcomed. This is s great location, the pictures do not do it justice. Everything a family or couple could want. The kitchen is well equipped, it is clean, not abused like some rentals we have had. The. Beds were comfortable. Two bathrooms is bonus. Having a starter pack was a good idea although we did do our shopping for the usual. Washer and dryer came in handy. Very pleased. Stark and Igo were excellent.